Qualicum Beach’s TimeLyne Electrical Services, Inc. has been operating as an electrical contracting business for 30 years. Founded originally in Victoria, BC, in 1986, by its namesake Tim Roberts along with the support of his wife Lynn, TimeLyne is now a long-time family run business owned and operated by their sons, Josh and Devon Roberts. 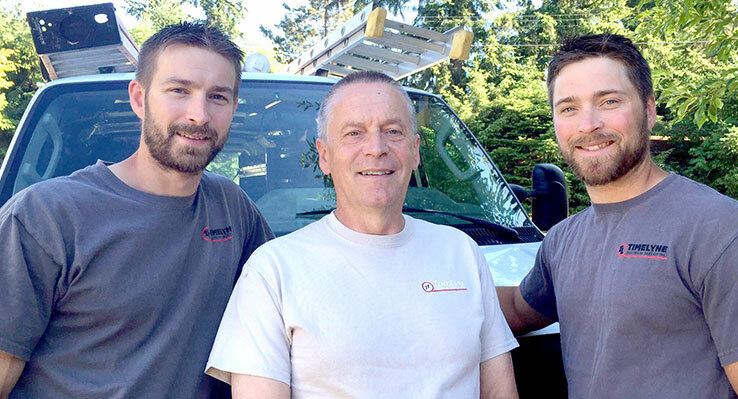 Working together as family and business partners, TimeLyne Electrical manages projects on Vancouver Island and beyond. With over 50 years combined experience in the field and new perspectives guided into the future by the backbone of the company’s foundation, TimeLyne will be providing quality workmanship for years to come. TimeLyne Electrical Services, Inc employs a staff who show a strong work ethic, consideration for coworkers, clients and professionalism, and who have an aptitude for the skills needed to provide quality, safe electrical work. Our employees show an interest in their work, have passion, competence and a drive to continue to learn. At TimeLyne, we closely monitor and train our apprentices to ensure our high standards are being met while encouraging a positive and supportive work atmosphere. Our integrity is what motivates us. A job well done is more than just getting the job done. It’s about doing our work well, safely, efficiently and honestly. It’s also important to give effort to maintaining positive relationships with our clients, contractors and other tradespeople or employees who we are essentially working with to complete a project. We mean what we say and we follow through with that in a professional manner. Getting a job done well will pay the bills…but it’s working with integrity that makes us proud of what we do.